I couldn’t stay away. After wintering in St. Barth I arrived back in the US and to my house on Cape Cod May 18. 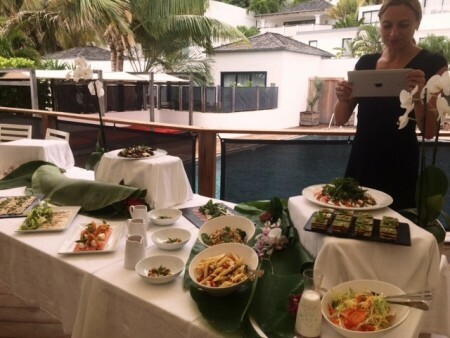 I went back to St. Barth June 17…I needed my fix. (Oh yes, and I desperately needed to see my hairdresser.) Connie Walsh, our marketing and travel industry consultant accompanied me this time because the main purpose of our trip was to gather information for our next Live Your Dream catalogue. (Connie and I have the same last name but we are not related. Everyone still thinks we are anyway.) We also inspected a couple of hotels and I added a fabulous villa to our portfolio (More on that in the July edition of our newsletter, Le Bulletin). We interviewed some very interesting people who will be featured in this year’s publication. I hope you enjoy the read. We were very fortunate to have been invited to stay at the hotel Taïwana for three nights. We had stayed there when it first reopened under new management but it was before the renovation began. It was a lovely hotel but it was dated. The rooms were dark, had terracotta floors and old fashioned bathrooms. The hotel closed for Value Season last year and the rejuvenation began. What a difference a few months makes! 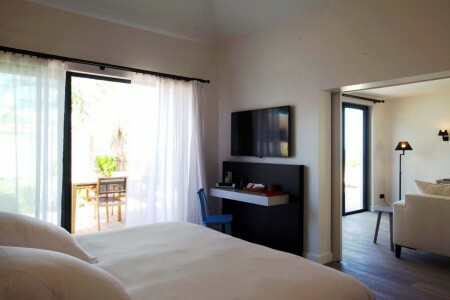 Witnessing the transformation from a somber hotel to a cheerful resort was a real pleasure. 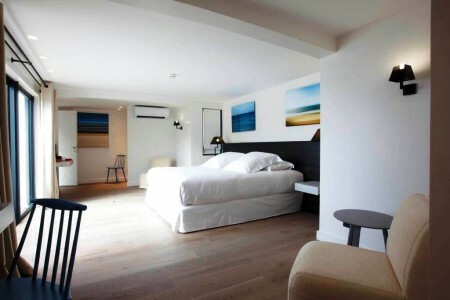 The rooms and suites exude a casual elegance using a palette of grays and whites. I stayed in the gorgeous Beachfront Suite with Jacuzzi (#3). 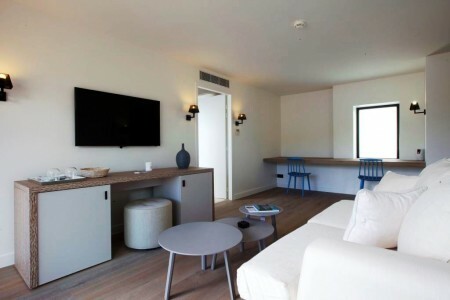 It features a king bedroom with satellite TV, a separate living room with a desk area for my laptop, a second TV, a Nespresso machine and a complimentary mini bar filled with juices, sodas and beer. The en suite bath has a separate WC, a large rain head shower and a bathtub. 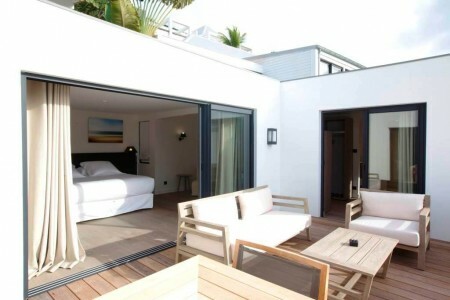 The outdoor space boasts both dining and living areas on the terrace, while the sandy area has two chaises for sunning. Connie and I enjoyed our complimentary Continental Breakfast on my terrace. I was even able to walk right out to the beach from my front yard. I walked out from my Beach Front Suite’s private yard and took this early morning photo of gorgeous Flamands Beach. 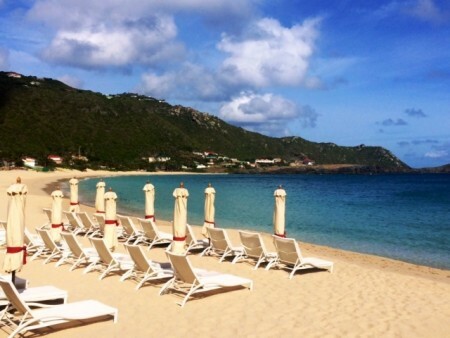 June is a wonderful time to visit St. Barth. Connie’s Ocean View Amber Suite (#4) was accessed by going up a couple of sets of stairs. This suite features a guest toilet off of the living room. This area also has the same amenities as mine did. The bedroom has a second TV and en suite bath. There is a terrace with an outdoor living area and a fabulous view. 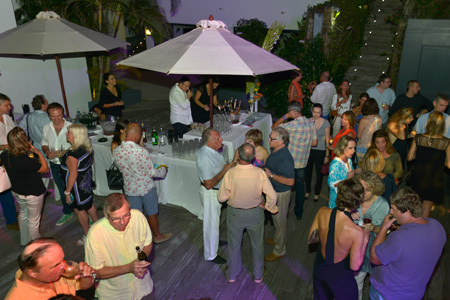 Our St. Barth office Concierge Magda Votava is the coordinator of this annual event and does a fantastic job. Magda, Connie and I were scheduled to have a lunch time “tasting” with restaurant manager Alexandra Ruiz so that we could select the menu. We tasted, and tasted and tasted for most of the afternoon. I had to ask them to slow down in between courses. Keeping our dinner reservation for that evening became less and less likely with each and every delicious morsel that we sampled. 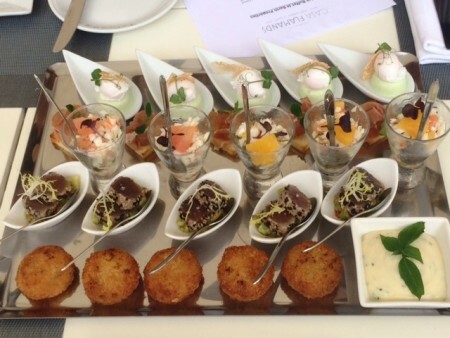 Canapés such as Sesame Tuna Tataki and Langouste Tartare with orange and vanilla dressing were delicious as was one of the main course’s options a savory roasted Lamb chop with thyme and garlic gravy sauce. Three and a half hours later we were stuffed but had successfully chosen our menu. We’ll begin with cocktails and passed hors d’oeuvres followed by appetizers, a large selection of main courses followed by dessert and dancing to tunes spun by the very talented and popular DJ Yo-One Sutter. The famous singer and guitar player Soley will be serenading us, too. 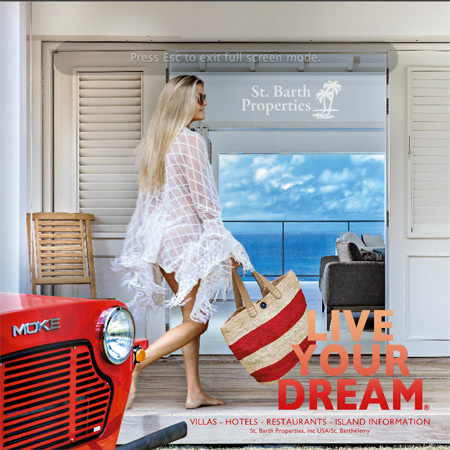 Mark your calendars and book your accommodation with us to include the evening of November 14, 2014 so that you can join other wonderful clients of St. Barth Properties, our villa owners and our hotel partners for a fun evening. 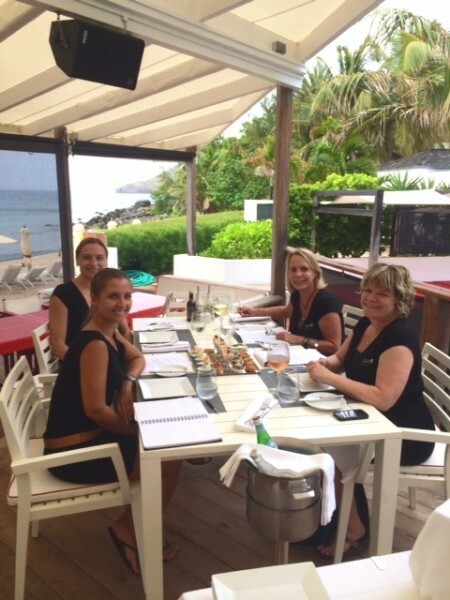 If you have not already made your reservation with us, contact reservations@stbarth.com or 1-800-421-3396. You will then receive an invitation from us. We will be honored and thrilled to see you there.